When I previously purchased this product, the brand name was Jet, but the packaging now says DaVinci Gourmet. Did I receive the correct item? Yes, the Jet brand has transitioned to the DaVinci Gourmet brand. Despite the name change, the pack size and product formulations have remained the same so you can expect the same great flavor. 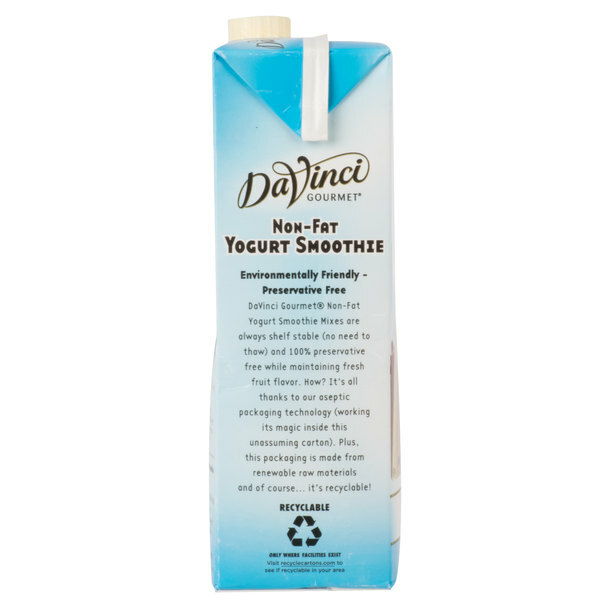 Creamy, sweet and naturally derived, the DaVinci Gourmet mango non-fat yogurt smoothie mix is perfect for use in your coffee shop, bar, cafe or kitchen! Made with real fruit puree from the natural flavors of mangoes and smooth, all-natural yogurt, this convenient 64 oz. carton is perfect for your smoothies and blended cocktails! Rather than taking the time to gather ingredients and concoct smoothies from scratch, save time and use this smoothie mix that includes non-fat yogurt for an extra creamy texture. Simply mix 2 parts ice with 1 part smoothie mix to begin crafting your smooth, blended cocktails, mocktails, and more! DaVinci Gourmet offers premium mixes in a variety of flavors. This non-fat yogurt smoothie mix is gluten free, so you can create smoothies to accommodate a larger number of patrons, even those with a gluten allergy. This mango variety blends the tropical taste of ripe mangoes into a creamy, smoothie mix. Its versatile flavor pairs well with banana, coconut, and more. Watch your profits rise when you offer refreshing fruit smoothies, and enhance your drink menu with new, flavorful items! 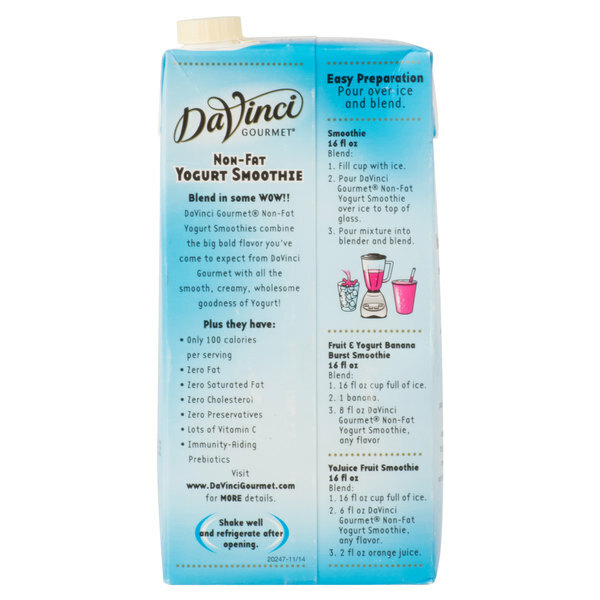 DaVinci Gourmet non-fat yogurt smoothie mix is packaged in a 64 oz. 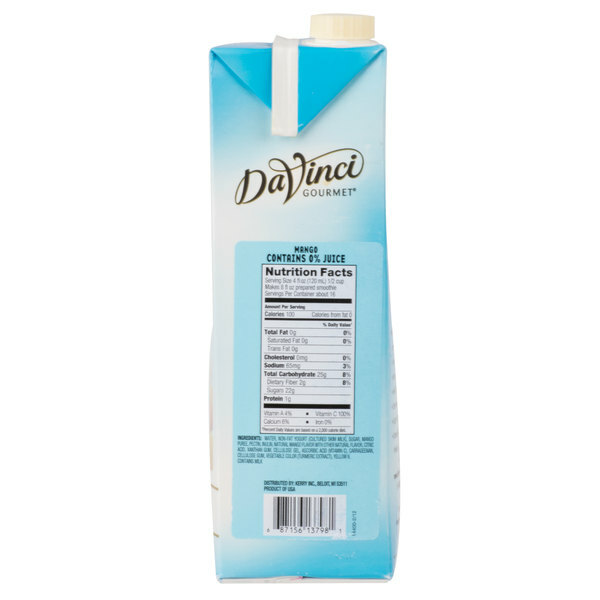 carton that is easy to store in your busy kitchen or bar, with a resealable cap that keeps any unused product fresh. Refrigerate after opening. This former Jet product has transitioned to DaVinci Gourmet brand. Despite the brand change, there have been no changes in pack size or product formulations so you can expect the same great flavor. 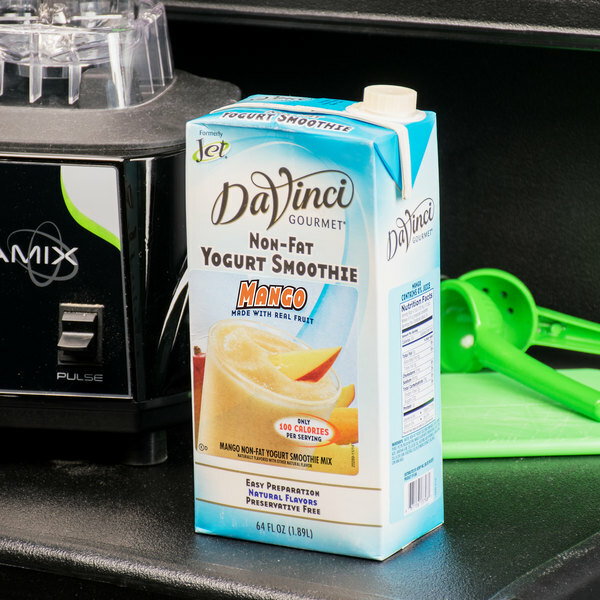 The DaVinci mango non-fat yogurt mix makes the best smoothie around. The taste is perfect and the texture of the mix is great. Easy and simply to make. A delightfully flavored mango smoothie mix with non-fat yogurt that makes a great treat. The mango flavor is so delicious and the is simple to prepare. 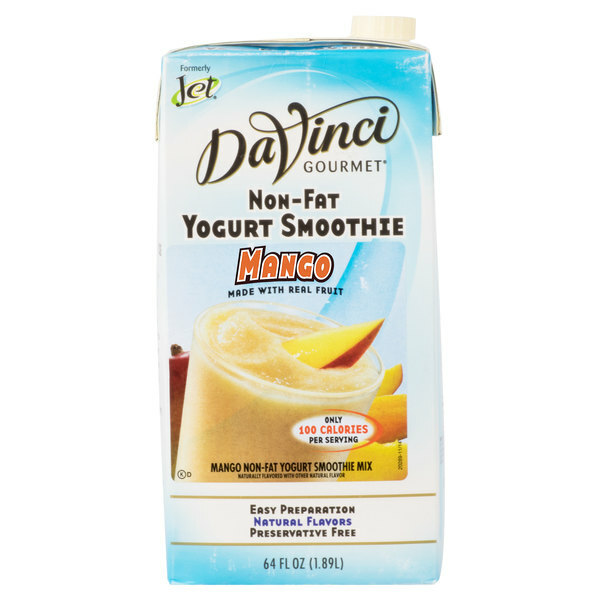 The DaVinci mango non-fat yogurt fruit smoothie mix tastes really good> The mango flavor is perfect ad the smoothie mix is so easy to use. A great addition to our smoothie stand. Great product. Great taste. Easy to make smoothies. I usually order these from my corp warehouse but I buy these out of convenience. Plus shipping is faster and cheaper. Good if your customer knows that this is a fat free item. This smoothie mix has a bland taste to it, but I guess its suppose to with the less sugar that its known for. I recently purchased a Ninja blender and was looking for smoothie mixes. I can make my own smoothies at a fraction of the cost. Mango was the first flavor I tried and it is my favorite.